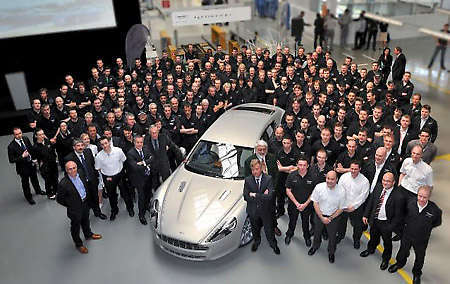 The first of the Rapides have rolled out from Magna Steyr’s factory in Austria for delivery to customers. The four-door sports car is set to reach buyers and Aston Martin’s 125 showrooms in 34 countries over the coming weeks. The Rapide is the first Aston Martin not to be made in England, although Aston promises that the Rapide achieves the “same exacting standards” as its other models from Gaydon. From the preparation of Rapide’s bonded aluminum body frame to the six-stage painting process where nine coats of paint are applied (Aston claims best in class paint finish), it’s all done at Aston’s dedicated area within Magna Steyr’s facilities. The contract manufacturer also takes on other tough projects, like making the Mercedes-Benz SLS AMG’s body (Gullwing doors) and the Peugeot RCZ (complicated double bubble roof/rear glass). The four-seat Rapide is powered by a hand-built 5.9-litre V12 engine producing 470 bhp and 600 Nm. It’s paired to a six-speed “Touchtronic 2” automatic transmission with steering column-mounted magnesium paddles. There’s also plenty of luxury in the package, but then this costs £139,950 in the UK, a lot higher than what Porsche charges for the Panamera Turbo (£95,298). The Rapide will race in the upcoming Nürburgring 24-hour race in “near standard” form, driven by a team of Aston engineers lead by CEO, Dr Ulrich Bez. Click here to see how the race car looks like. Previous Post: Lotus Racing at the Spanish GP – Moving forward?